Paddle Cores – Nomex, Aluminum, Polymer, oh my! The first light-weight composite core put into pickleball paddles was the Nomex honeycomb core. Nomex technically is a “a registered trademark for flame-resistant meta-aramid material developed in the early 1960s”, according to Wikipedia. This is the original cardboard-like material that is then dipped into resin to toughen it up. 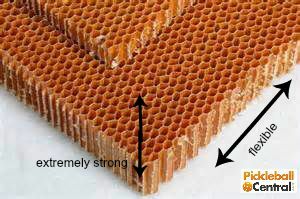 A fun property of this core is while it’s extremely tough while applying pressure down onto the honeycomb core, it is squishy while squeezing on the side of the core (as shown below). Nomex core in general is the loudest of the three cores, as well as the hardest. Nomex cores will give you great pop and the ball will seemingly fly off the paddle’s surface. Check out some of our most popular pickleball paddles with a Nomex core, including the Rally Graphite and Z5 Graphite. The second honeycomb core found in pickleball paddles is aluminum. Aluminum cores are exactly what they sound like: honeycomb-shaped cells made of the metal aluminum. Aluminum cores are well-known for being the best at providing “touch”. We consider touch to be maneuverability, ball placement and finesse at the net, or being able to perfectly place your shot. Aluminum honeycomb core is slightly softer than Nomex, meaning the ball pops off just a bit slower which gives you more time to manipulate the ball. Aluminum cores are usually quieter than Nomex cores as well. The most popular pickleball paddles with an aluminum core are the Phantom Graphite and Selkirk 300A Graphite. The newest core is polymer, which is basically a plastic blend developed specifically for pickleball. Just like the other two cores, it’s laid out in a honeycomb pattern. Polymer cores are the softest and quietest cores on the market. Because it is a plastic, each hit is quieter since the surface isn’t quite as hard. Lots of communities with noise restrictions list paddles with polymer cores the most frequently on their “Quietest” or “Approved” paddle list. Because polymer is the softest core, you’ll find that these paddles give you an immense amount of control over shot placement. The most popular polymer core pickleball paddles are the Element and Tempest. What’s your favorite type of pickleball paddle core? I’m reading different information on different sites. On this site it states that the Polymer Core gives “you an immense amount of control over shot placement.” First off, I would guess that control and shot placement are the same idea so I’m not sure how the Polymer Core can give you one over the other. On Pro-Lite’s website it states that the Polymer core “has great power but you’ll sacrifice some control”. That seems to contradict this site’s info. On Ultrapickeball’s website it states “It allows players to have greater control over the ball on the court.” It seems that most sites state that the Polymer Core is for control, not power. It’s annoying because Pro-lite makes paddles, but then it seems to state the opposite of other sites. Who to believe? I can’t speak for Pro-Lite and I’m unsure why they list polymer as being more power-oriented, but even on that post they note Nomex is indeed harder than polymer. If you toss a pickleball against two different materials of the same weight, then of course the harder, denser material will cause the ball will react more quickly. In our experience polymer core paddles have a softer, dampened feeling and are more suitable for control-oriented players where Nomex will offer more speed and “pop.” This isn’t to say you can never get power with polymer core paddles, just that they will feel and play differently. Thanks for the reply. What you’re saying makes sense and follows what I usually read out there. Thanks again.